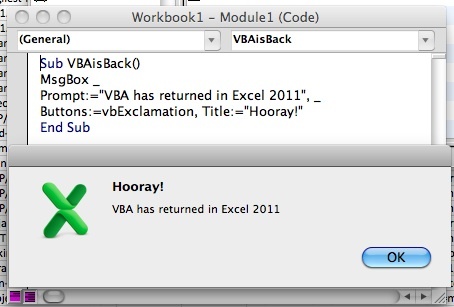 One of the things that I missed in the last version of Excel for the Apple Mac was that VBA was dropped. If you read this blog you will know how useful VBA can be for automating a bunch of different things. So when I loaded up Excel 2011 the first thing I did was test out the VBA. Yep, it works. The rest of the application looks like it got polished up as well and at first glance seems easier to work with than 2008. It doesn't make my fan turn on immediately either, so I'm much happier using it on my old macbook. I like the new Mac office. Other than the return of VBA, nothing monumental but it's much smoother and less quirky. Hope all is well. I *finally* got my free Project 2010 Pro from the Project Conf last year in Phoenix. The previous article is Project Server and Report Builder 3 Null Value Error. The next article is Project Server 2010 Timeline Issue.